A WiiWare download game where you play as a rock climber. Using the Wii Remote and Nunchuk, place your hands and feet on the protruding rocks in order to scale the wall within the time limit. You can optionally use the Wii Balance Board to control the climber's feet by shifting your weight. 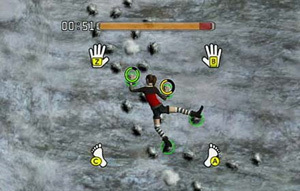 When you reach the top, the player will perform an air guitar solo or receive an electric guitar to play. There are several rock faces you can climb, with unstable footholds, waterfalls and slippery moss on later levels.